No food is safe from the dangers of overeating, but fiber-rich fruits and vegetables are less likely to have a negative effect if they are over-consumed. Cranberries are fiber-rich and full of antioxidants, which earns them a reputation as a "superfood." However, eating the proper serving size will assure that you gain the benefits without unwanted weight gain or other complications. A 1/2 cup serving of fresh cranberries contains only 30 calories, 6 g carbs and 2 g fiber. Cranberries can be eaten dried, fresh, frozen or canned. You should always check labels for added ingredients in canned and dried fruits, as they may contain syrups, sugars and other extra hidden carbs. Amy Howell, a Rutgers University researcher, reports to MSNBC the many health benefits of cranberries. Research has found the drinking cranberry juice can actually help prevent urinary tract infections. Howell's research found a compound in cranberries, known as "proanthocyanidine," that prevents plaque from forming on the teeth. Finally, cranberries and cranberry juice can kill some bacterias that cause ulcers and even stomach cancer. At 30 calories per cup for fresh cranberries, overeating is not as dangerous as it can be with other higher-calorie foods like peanuts, almonds or other fattening snacks like potato chips. 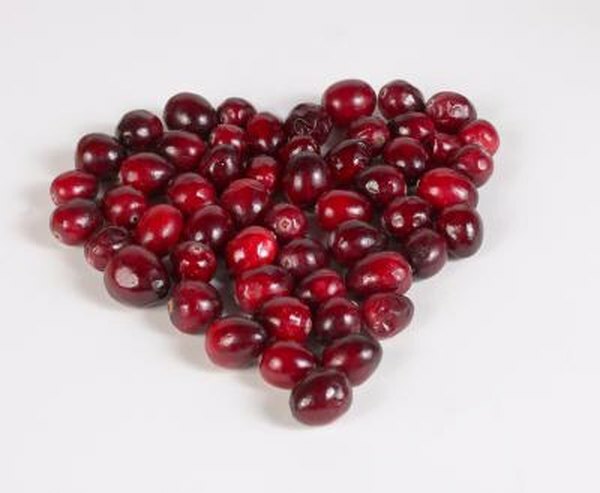 If you were to eat 4 cups of cranberries, a very large, you would still only consume 120 calories. However, consuming large amounts of cranberry sauce or cranberry juice can easily pack on more calories, because these foods are much higher in calories than raw cranberries. A half-cup serving of cranberries contains only a moderate amount of fiber, but if you eat too many, you might end up consuming several grams of fiber in one sitting. While fiber offers health benefits, too much at one time can negatively affect your digestive tract, causing diarrhea, constipation, bloating, gas and abdominal pain, especially if you're not used to a high fiber intake. Keep your cranberry portions moderate -- between one-half and one cup -- to prevent these problems. Focus on satiety to prevent over-eating cranberries. Choose whole cranberries over juices helps fill the stomach and produce satiety. Combine cranberries with other filling foods and ingredients so you won't be tempted to eat large amounts of berries. For example, try baking fresh cranberries into whole-grain bran muffins, or top your oatmeal with fresh cranberries and toasted chopped pecans. The whole grains in both foods help fill your stomach, and provide fiber to help you feel satisfied.